How sweet is Peach! Peach came to us from another rescue as a hurricane Michael survivor! 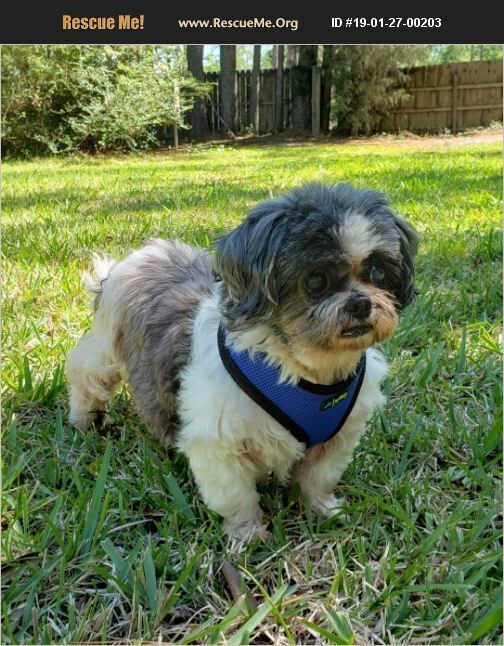 She is a 10 year old Shih Tzu who is a 13 pound bundle of love! Peach is a sweet, happy and laid back girl who settles in quickly and loves her people. She has limited vision but that doesn't slow her down one bit! She will greet you when you come home by dancing around and talking to you! She is good with other dogs and cats and even plays with ferrets! She is working on her potty training and has been doing well going outside on a regular schedule, but she will use a puppy pad inside if she needs to go and can't get outside. Peach suffers from Dry Eye which means her eyes do not produce tears anymore, so she will require drops for the rest of her life or she will go completely blind. Due to her sight issues we do not recommend she go to a home with young children but older children would be just fine. Peaches is looking for her furever home to enjoy her golden years. Could that home be yours? Applicants must live with in a two hour drive of Pensacola, FL. to even be considered. Please go to our website fbsbrescue.com to fill out an adoption application. Adoption fees are posted for each animal. Thank you for choosing to adopt!